The Chinese Communist Party plans to increase its defense budget to $132 billion in 2014, according to a recent announcement. The budget marks a 12.2 percent increase from its spending last year. The announcement was made through China’s state-run news agency, Xinhua. It cited a draft budget report that was submitted for review on March 5, confirming rumors that the Chinese Communist Party (CCP) was planning to grow its military spending. Outside analysts typically assume that the official numbers underestimate the real spending. The increase follows a trend of China’s almost annual double-digit increases in defense spending for the last two decades. The increased spending is comparatively lower than some years, which saw more than 17 percent increases in 2008, 2007, 2002, and 2001. Regardless, the continued pattern has China’s neighbors concerned, who view it in light of growing territorial disputes. Taiwan’s Democratic Progressive Party was already urging the government to increase its military spending to three percent of its GDP on March 4, in response to China’s increases. There is a fine tinge of irony to China’s announcement, given that Chinese leaders were criticizing Japan in December 2013, when Japan announced a five percent increase to its $59 billion defense budget over the next five years. Chinese leaders said Japan was using regional tensions as an excuse to build up its military, according to Japan Daily Press. Chinese leaders have played different lines on their much larger—and continued—increase in defense spending, however. 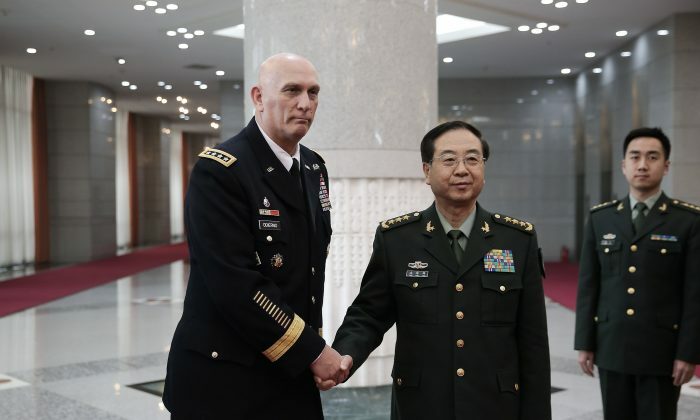 “In order to protect the country and safeguard regional peace and stability, China has to enhance its national defense,” said Chen Zhou, a deputy of China’s National People’s Congress, according to China’s state-owned China Daily newspaper. The line to protect “regional peace and stability” is commonly used by Chinese officials to excuse their increasingly heavy-handed methods of trying to grab up disputed territories. While China has shown large and regular increases in its defense spending over the years, the real concern is what Chinese leaders are not announcing. “Chinese media reports tend to summarily dismiss reasonable foreign (and some domestic) concerns about Beijing’s limited defense spending transparency and rapid military development, failing to recognize both the potential threat that China’s increasingly capable military poses to its neighbors and the fact that these neighbors have legitimate rights and interests of their own,” said Andrew Erickson of the Naval War College in a Jan. 30 congressional hearing. Erickson noted that China’s announced military budgets do not align with its military spending. The Pentagon believes China’s actual defense spending is much higher than what it says publicly, according to AFP. In 2012, for example, China reported its defense budget at $106 billion, yet the Pentagon believed the actual budget was between $135 billion and $215 billion. China has the second largest defense budget in the world, second only to the United States which has a $572 billion defense budget—which has been decreasing with cuts to the federal budget.